It is 25 years since the first comic relief this year and when I hear this I immediately felt old. 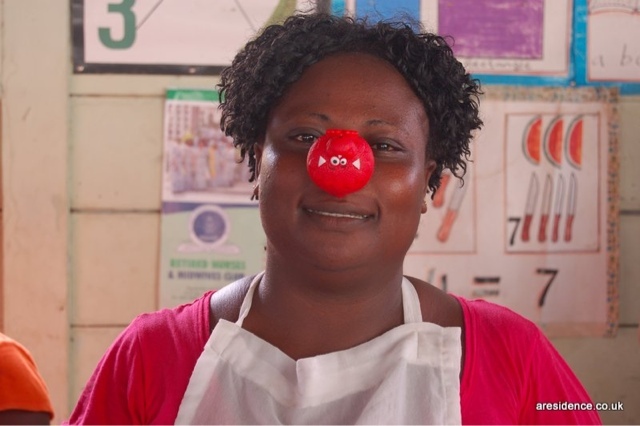 I remember being 10 years old when Comic relief was launched and buying that first Red Nose and wearing it all day at school with my friends despite it being made of pinchy uncomfortable plastic, those little noses have come a long way since then and Comic Relief continues to do amazing work. Back then I knew it was to raise money for people in Africa and we got to have fun doing it but it is not until you get older that you pay attention to videos of the celebrities going out there and visiting people in appalling conditions without the basic things that we take for granted everyday. Three lovely fellow bloggers who I recently discovered on twitter and have just had the amazing opportunity to visit Ghana with Comic Relief and see some of the #goodwork that this amazing charity does and they sent me the picture below. I got to choose which of the places they were visiting that I wanted my photo to be from and naturally I went with the food option and my photo is from The Virtuous Women’s Bakery. This amazing lady is Veronica. You might have seen her on television, on the Comic Relief Great British Bake Off selling bread made in the bakery on the beach. The Virtuous Women's bakery allows women to earn money while their children play and learn in the nursery across the courtyard.